I have a dilemma! It's about my centerpieces. 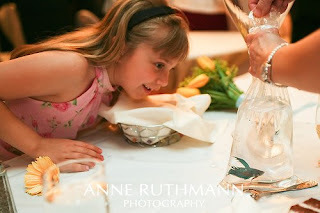 Since I first begin planning my wedding one of the main things I have always said I wanted were fish in my centerpieces. I really don't have a preference to what is on top of the water or in the water with the fish but I know I want fish. Our colors are Blue and Yellow and I've seen some really cute blue and yellow fish out there. However, my dilemma is what to do with the fish when I am finish with the reception. With 200 guests and 90% of them traveling, I don't think my aunt's idea to give them away would go over so well. I don't think there would be enough people who would want to take the centerpieces home with them. The other dilemma is that my FH really wants floating candles somewhere incorporated in the event. Let me first say that he has been great in his participation of this planning process. He hasn't really asked for much but he did identify floating candles as a "must have". 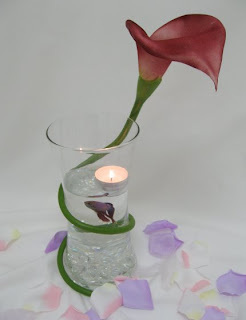 I am considering using floating candles as the Unity Candle at the ceremony but he also wants them at the reception. So my question is: "Can fish live in water when a burning candle is floating on top the water?" That may be a silly question but I would hate to kill the fish by burning the candle and have poor dead fish at my wedding reception. That would be horrible!!! 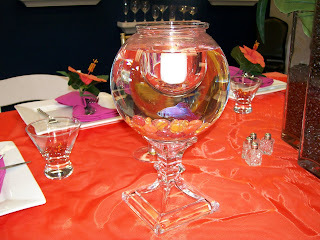 Here is a nice article about fish centerpieces! Im no expert at all but I think that they would live, just don't get goldfish!! They barely make it home from carnivals. Very creative idea! I would suggest giving the fish to a daycare or a school. Also when you buy your fish make sure you have extras in case some die before the guest get there and do a test trial with the flowers so that you know for sure the little fish will last as long as you need them with the typ of candle you want burning and everything. I looked into some fish stuff since we are having a nautical wedding. Goldfish will pretty much die pretty quickly without oxygen flowing through. So if you don't want to risk belly up fish by the end of the reception, stick to betas. That's a cool idea. I just recently saw that concept on an episode of Rich Bride, Poor Bride on WEtv - if I'm not mistaking, she had floating candles on hers as well and it was fine. I hope you do figure out a way to make it work since that would be such a unique detail at your wedding. Good luck with that! I have no clue whether fish and floating candles can co-mingle with out a tragic ending. 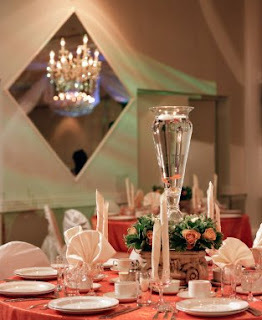 Could you maybe group the vases (have the main centerpiece vase with the fish and cool rocks in it but then have a vase or two that are smaller with floating candles around the main vase with the fish)? Good luck with the search! Yes candles will be okay! If any wax slid off the side of the candle, it would cool and harden as soon as it hit the water! As long as you get bettas then you have no problem with size of the bowl or oxygen (like I mentioned to you before, Bettas can breathe oxygen just like people do! They don't need it in their water). Another idea-- you might pick a handful of tables to do Betta's on rather than doing them on every table, so you have less fish to worry about. 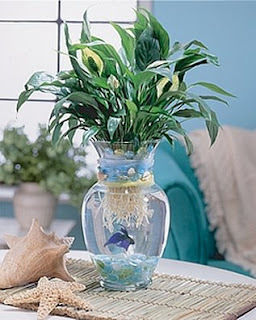 You could leave a note for guests on the table to encourage them to take the whole vase/beta home with them! You backup plan can be the children's hospital-- or you could talk with some local elementary teachers and see if they would like to "adopt" the fish for their class! So I forgot that I had bookmarked some fishy decor on my desktop and I just accidentally clicked on one and it reminded me to share it with you! 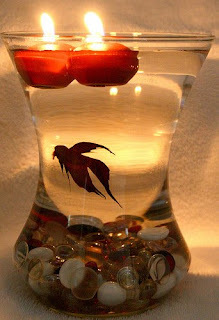 I think, the fish will have no prob with floating candles. And I need to agree to Tere.